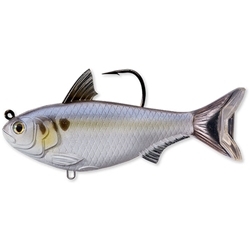 When Bass get dialed in to a big Shad bite, the new LIVETARGET Gizzard Shad Swimbait is an ideal match. With a wide and deep body, anglers now have a big profiled swimbait to target shallow to deep ranges. The Oscillator generates a moderate wobble action. Available in 3 sizes. Freshwater.